Photography often is an expensive hobby/endeavor and buying a battery grip is certainly no exception. I absolutely adore (Nikon’s D610](http://imaging.nikon.com/lineup/dslr/d610/features04.htm)) for its amazing capabilities compared with a very reasonable weight and price. 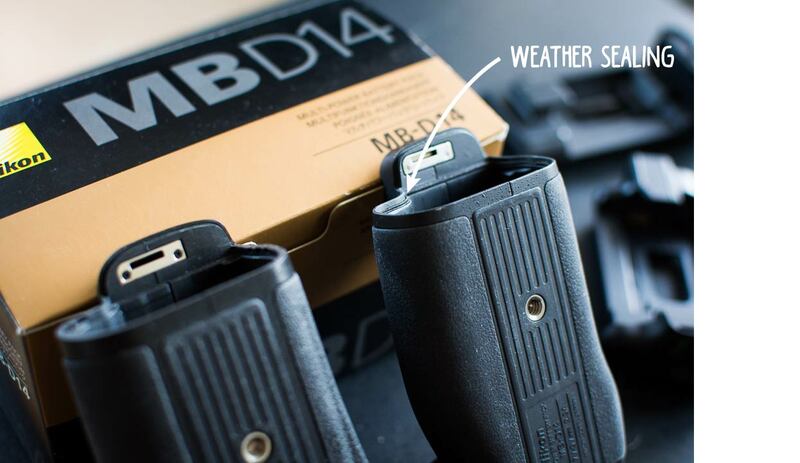 However, the grip, Nikon’s MB-D14, currently comes attached with a 200 Euro price tag (i.e. approximately 15% of the cost of the body itself). Naturally, third-party clones are a very attractive alternative. On Amazon, a Minadax MB-D14 clone currently costs 46 Euros. In other words, I could buy four of the clones for the price of the original. The reviews on Amazon are mostly very good and customers (also of other third-party brands such as Meike) seem very satisfied with what they got. The question remains: It the original worth the additional 150 Euros? Since I happen to have both models lying around, I want to do a little comparison. I’m going to talk about the outer appearance and build quality, the functionality, and different use-cases for both variants. Disclaimer: Because I use the Minadax on my backup body I have less experience using it. I also have not used it as rigorously than the original. Attached to a camera, both grips look very much alike. If you look closely, the Minadax, being slightly larger in size, does not perfectly align with the edge of the camera. Put simply: If you put the original grip on your camera, they become one coherent unit. If you put on the Minadax one, you will be reminded (slight creaking, rougher edges) of using a grip from time to time. Looking at them without a camera attached reveals some slight visual differences. 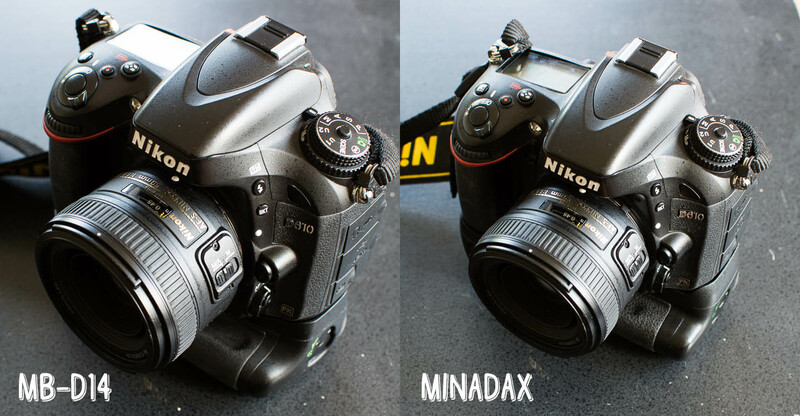 The Minadax is larger and the actual grip has a straighter edge than the Nikon one. On the bottom, the original has some information about the product, while the clone is just blank. Also, looking at the battery compartment, they use different connection systems. While Nikon has their connectors on the top, Minadax has them one the bottom. This makes interchanging the battery trays impossible. The difference in size becomes even more apparent if you put the grips two next to each other. 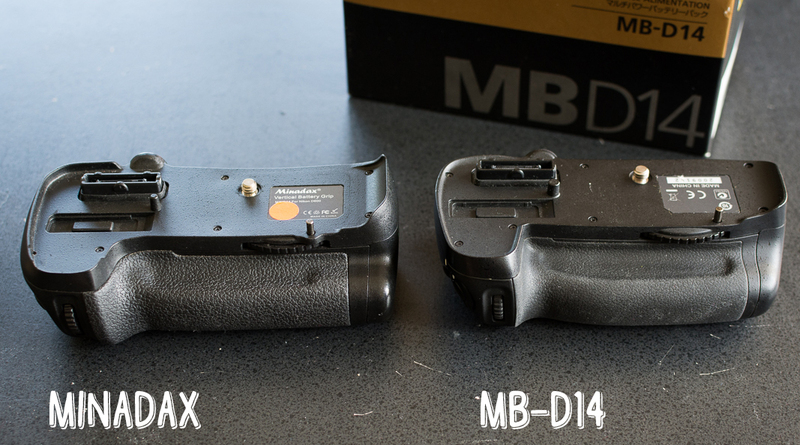 However, while the Minadax is almost a centimeter larger, it’s less heavy than the original Nikon MB-D14 (220 grams vs. 260 grams). 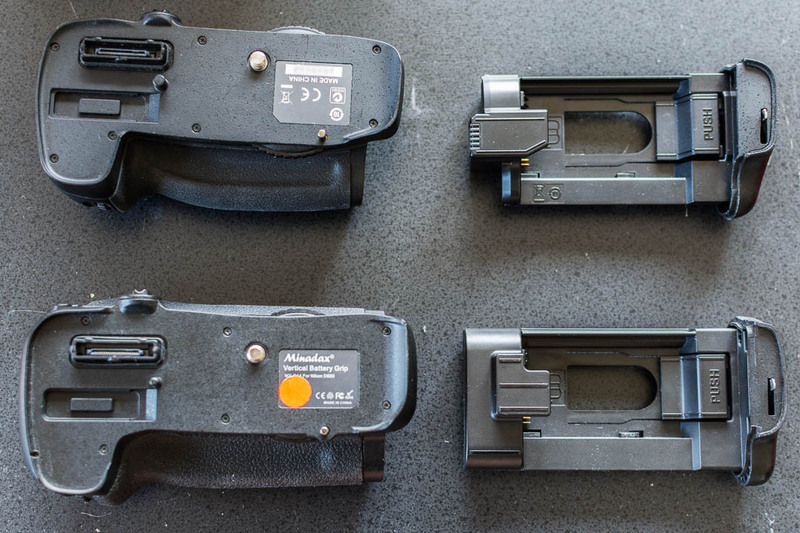 This difference in weight is due to the cheaper plastic and less metal used in the Minadax grip. From this angle you can also spot another slight difference in the shape of the grip-piece which has has a larger dent on the original. The original’s haptic experience matches the camera perfectly while the Minadax is less smooth and slightly ‘plasticky’. The textured material covering the grip is also better on the original and has a much finer texture than on the Minadax. This being said, the Minadax feels very sturdy for its price and you probably wouldn’t spot the difference right away. It also doesn’t feel too much out of place or ‘cheap’ in any way - it just doesn’t perfectly match the feeling and build quality of the original. Both grips are reinforced with two metal strips in the bottom and top. I would trust both models, this is obviously more surprising regarding the Minadax, in combination with a Black Rapid (or similar) camera strap if I’d be using a lighter lens. Carrying around a D610 with a 70-200mm and a SB-800 attached to the Minadax grip seems like a disaster to happen though. Nikon’s buttons and scroll wheels are considerably better, but probably not four-times better. Nonetheless, speaking from years of experience with various third-party grips, Nikon’s buttons are made to last while third-party ones tend to fail under heavy use. In terms of functionality the two grips do exactly the same. Both come equipped with two battery trays – one for the EN-EL15 lithium-ion battery and one for AA batteries. Also both have two scroll wheels, a joystick, and an AE/AF-Lock button. The LED-indicator will randomly flash at times, especially if you put some force (read tripod-mount strap) on the grip. Rarely the grip would lead to the camera getting ‘locked’ by trying to focus indefinitely. I believe that this is a problem with the connector of the shutter button. Sometimes the battery in the grip would drain over time. The buttons are, as stated before, of subpar quality and tend to fail from time to time. All of these could just be due to my model having these issues. Generally speaking, with these cheaper third-party camera products there is more variability in quality. However, both Amazon reviews and previous experience with similar models indicate that these are rather common problems. If you are experiencing them regularly or in bulk, definitely try to get a new one from the reseller. Before going into the details, I want to get one point across: For the price, the Minadax (and others) are amazing devices that will serve their purpose just well. Having said this, I now need to make a case for spending the two hundred Euros on the original Nikon MB-D14. Put simply, I would recommend it for everybody who needs their camera to function at all times and even in tougher situations. You just shouldn’t be afraid that your shutter button won’t fire during a rainy wedding ceremony or during that one incredible goal on the playing field. Nevertheless, all of the problems and downfalls described above could be negligible if you just want to take family portraits more comfortably or have an extra battery during your amazing holiday trip. You want to use your grip in the rain, dirt, and sand. You want to (regularly) use the grip in combination with a tripod-mount grip and/or a tripod. You cannot have glitches and need to have the most reliable equipment possible. You have a very low tolerance for differences in build quality. You can spend the extra 150 Euro without too much hassle. On the other hand, don’t (necessarily) buy the original if you are just planning to use if from time to time. If you can tolerate the chance of glitches and a slightly less sturdy build quality, the clones will be a very good choice for you. Futhermore, even though is a very specific reason, the clone could be the better options if you’d really need or want that extra centimeter of total size.